I must confess to bearing a grudge against Lawrence Kasdan. It was bad enough that his over-hyped film, The Big Chill, turned out to be thoroughly mediocre. Even worse was the fact that it seemed as though at every party I went to when I was in my early twenties, someone would play the Big Chill soundtrack. When I was in high school, I had to listen to Joy to the World (Jeremiah Was a Bullfrog) about a million times, and now here I was, an adult, Mr. Would-be Hipster, listening to that same stupid song another million times. I do not forget, and I do not forgive. Still, I tried to keep an open mind while I was watching Kasdan’s latest film, Darling Companion. Beth Winter (Diane Keaton) and her daughter, Grace (Elisabeth Moss) find a stray dog along the side of the road. 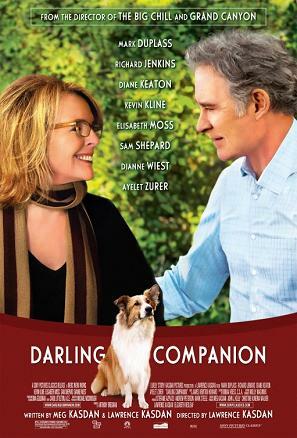 Over the objections of Beth’s husband, Joseph (Kevin Kline), they adopt the dog and name him Freeway. A year later, Grace has her wedding at her parents’ second home in the Rockies. Joseph’s sister, Penny (Dianne Wiest ) attends, along with her fiance, Russell (Richard Jenkins), and her son by a previous marriage, Bryan (Mark Duplass). Both Bryan and Joseph are wary of Russell, who they suspect is trying take financial advantage of Penny. The next day Joseph takes Freeway for a walk in the woods. Freeway chases a deer and runs off. Joseph is unable to find him. When he tells Beth about this, she is immediately upset, especially since she has always suspected Joseph of not really liking Freeway. Penny, Russell, and Bryan all volunteer to stay longer to help find Freeway. The Winters’ housekeeper, Carmen (Ayelet Zurer) tells them that she is half Gypsy, and, as a result, she has psychic powers. In spite of Carmen’s not quite convincing accent, they believe her. It was not clear to me whether Kasdan was trying to poke fun at a stereotype of Gypsies, or whether he was simply using this as a plot device. Unfortunately, I suspect the latter. Carmen has “visions” of Freeway’s whereabouts, which inspire the others to go off looking in various places. They are sometimes assisted by gruff, but lovable, Sheriff Morris (Sam Shepard). (From my own experiences with sheriffs, I would say that while they are often gruff, they are rarely lovable.) During these excursions, the characters “grow”, as they say in the screenwriting business. Beth and Joseph are eventually reconciled. Bryan realizes that Russell is really not a bad guy. It’s all very pat and predictable. And of course they finally find Freeway in an extremely improbable manner. The actors in this film all try hard, but they can’t overcome Kasdan’s by-the-numbers approach to screenwriting.